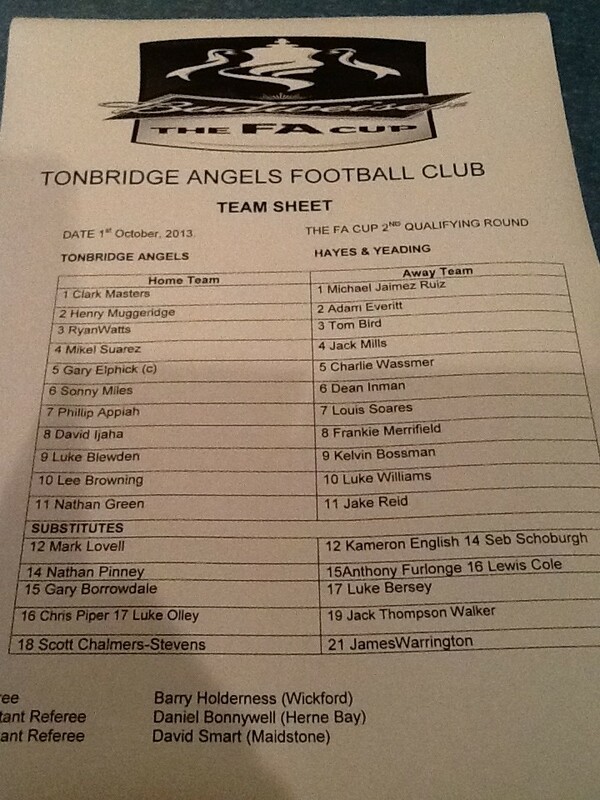 Tonbridge Angels progressed in the FA Cup at the expense of Hayes & Yeading United in controversial circumstances. After 10 minutes of sparring, Charlie Wassmer had the first effort on goal but his header from Jack Mills' corner was comfortably caught by Tonbridge's former United keeper, Clark Masters. In response, another former United player, Phil Appiah, had a deflected near post cross which Mikhael Jaimez-Ruiz reacted well to keep out. The main talking point of the game came in the 22nd minute. In front of a rather bemused crowd, Kelvin Bossman was sent off for swearing at an opposition player. Appiah hit a far post volley back across the face of goal as Tonbridge sought to take advantage. He then hit a rasping drive from a long way out which Jaimez-Ruiz brilliantly beat away. However, on 31 minutes, Gary Elphick scrambled the ball in from close range after a deep cross nodded back into the danger area by Mikel Suarez. Two minutes before half time, Suarez headed in a deep cross to make United's task even harder. Just after half time, Nathan Green crossed for Appiah but Jaimez-Ruiz bravely blocked his close range shot. United's best chance to date came on 57 minutes as Louie Soares hit a free-kick which cannoned back off the post. However, despite the visitors showing more attacking intent, Jaimez-Ruiz had to be alert to keep out Green's long shot and Luke Blewden had a glancing header flash just wide from Henry Muggeridge's cross. United got a foot back into the tie in the 80th minute. Charlie Wassmer threaded a throughball to substitute Seb Schoburgh despite a late challenge and his pass put Frankie Merrifield in on goal and he finished with aplomb. Williams then fired an angled drive on target which Masters held at his near post but Tonbridge managed to slow the game down sufficiently enough afterwards and won through despite a valiant attempt from the visitors.